The rewards of deep reading (reading several books on the same subject or by the same author) are plentiful: synthesis, comprehension, analysis. Or just the possibility of remembering the main point. Reading widely pays well, too. The stab of joy, the searing beauty of synchronicity! When I read Book G and it revisits something I read in Book B with no obvious connection between the two? Oh, man. It gets my voice in the high treble range and sets my fingers aflutter. I thought it would be fun to classify my reading list for 2015 chronologically by publication date. I like old books, yes. But I also have been guilty of reverse-snobbery, where I lift my nose a few centimeters and declare that I’m not all that interested in modern writing. Blech! (autocorrect wanted to change that to belch; that works, too!) As you can see, I’ve overcome that weakness, haha! Photograph is my granddaughter, reading Goodnight Moon to me. Before we drift to sleep, I read aloud (sometimes just a paragraph, other times a page or two) from Mark and Grace Driscoll’s Real Marriage ; we wake up to The Last Battle (snicker about that combination). When I drive the car, I listen to Kathleen Norris’ Acedia & Me . Acedia means lack of caring…sort of like depression, but different. If I have an afternoon with my eight year old grandson, our real aloud is Where the Red Fern Grows . We are at the happy parts of a compelling story; Gavin begs for one more chapter. I’m plowing through Colin Thubron’s book Shadow of the Silk Road , a travel memoir. I believe this is the loveliest book cover…ever! So much terrain is unfamiliar; it takes longer to assimilate this reading. I had read the first two chapters a while back and put it down. When I retunred to it a few months later I had to start at the beginning. With forty pages to finish, I’ve read Thubron through China, Uzbekistan, Afghanistan, Iran, and we’re entering Turkey. Donna at Quiet Life started a book club reading Bonhoeffer . I listened to it in 2012, and immediately bought the print copy because I wanted to read it with my eyes. What a remarkable family! What a rare jewel of a man! Cindy at Ordo Amoris started a book club reading Hidden Art , in honor of the late Edith Schaeffer. I just located my copy and am happy to be re-reading this gem. So you could say I’m filling my mind with art, Asia, apes, apathy, Achtung!, amicability, and adventure. 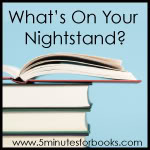 I love 5MinutesforBooks.com’s feature What’s on Your Nightstand? It’s fun to get a snapshot of what people are reading. 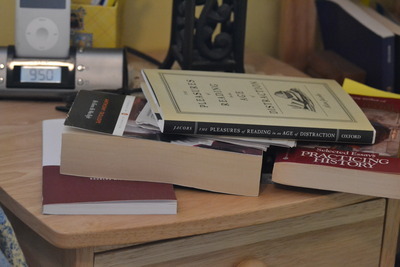 Clearly, I did not tidy up my stack of books on the nightstand. I can’t go into much detail, because of time constraints, but here is the stack I am working through. I ran out of my favorite Post-It Flags, as you can see by the pencils stuck in the books. Shame. • Real Marriage, by Mark and Grace Driscoll is on loan from my son and his wife. I want to read parts of it aloud with my husband…someday! • Barely visible, the tiny sliver of blue, is Fit to Burst by Rachel Jankovic. This young mom has an abundance of wisdom that reaches far beyond homemade granola bar recipes and stars on chore charts. I like to consume it in small bites. • The back cover showing, Shadow of the Silk Road, by Colin Thubron, is my current travel book. In this book Thubron travels from Xian, west of Shanghai, to Antioch in modern day Turkey. This is my third Thubron; I’m already inclined to like his writing. But I’m not sure he’ll be able to entrance me like Rob Gifford did in China Road. • The generic black journal is my commonplace book. This is my fourth identical journal, purchased at WalMart, in which I write down quotes, phrases, words, book and DVD titles, and similar musings. • The Sweetness at the Bottom of the Pie, a Flavia de Luce mystery by Alan Bradley, has been borrowed for far too long. I listened to the highly excellent audio version, but wanted to copy quotes from it. Which involves a re-reading with some skimming. So this title is the most guilt-inspiring one. • Black bound Kindle rests on Flavia. I read the sample portion of Booked, Literature in the Soul of Me, by Karen Swallow Prior. An email reminded me that I had an unused gift card from Amazon, so I purchased the book today. Although I keep acquiring Kindle books, I haven’t read much except the Bible on it in February. • The orange spine of Scrolling Forward, Making Sense of Documents in the Digital Age, by David Levy, is a book that simultaneously provokes groans and stubbornness in me. I was “Currently Reading” this on Goodreads on September 9th! The author, after finishing a Ph.D. in computer science, majoring in Artificial Intelligence, moved to London to study calligraphy for two years. That alone makes me like him. And the dedication in Hebrew. But, this book from 2001 is outdated. And for some reason I can’t ditch it. My persistence—foolish or not—was rewarded in chapter 10 with a great story about the 1989 San Francisco earthquake and the author’s assignment for a Hebrew class to translate Psalm 104:5. I have twenty pages left and I’m determined to finish. But the joy left a while back. • Top of the pile is This Rich and Wondrous Earth, a Memoir of Sakeji School, by Linda Moran Burklin. I’ve read Wes Stafford’s book Too Small to Ignore and several magazine articles revealing abuse and mistreatment at African boarding schools for missionary kids. This book is not about that. Linda’s book has a good-natured humor that acknowledges the hardships and difficulties, but also points out the benefits she received and the fun she experienced. I have to admit that the tight regimen and censored letters home has reminded me of prison. Last night we read a few pages aloud after dinner about a baptism that had us all laughing. It sounds sacrilegious, but it truly was a funny baptism story. I know of an MK who found Linda’s book very therapeutic. I’m eager to finish it and pass it on to my cousin who was at a different African boarding school. • There is a secondary pile behind the towering one with two books: Muriel Barbery’s The Elegance of the Hedgehog and John Stott’s The Birds Our Teachers. You might call this the “Meaning To Get To” Pile. You are welcome to join the crew over at 5MfB or just write in the comments. What are you reading? Practicing History , essays from Pulitzer Prize winner Barbara Tuchman, yields as much about the craft of writing as it does about history. I’m taking my time with this book, sniffing the words, swirling them around in my mouth, enjoying the flavors and textures. the most difficult, the most delicate, the most fraught with error as well as art. Ability to distinguish what is significant from what is insignificant is sine qua non. Many named Eric Metaxas’ biography, Bonhoeffer: Pastor, Martyr, Prophet, Spy , the best book of 2011. I was delighted to discover that our library had the audio version of this available. I’ve been listening primarily while I cook and clean the kitchen. Most sections I listen to twice before advancing to the next chapter. I expect I will get the print version of this book and re-read it with pencil at hand. Alan Jacobs came into clear focus this past year. I watched symposiums, read reviews by and about him, and decided he’s a current writer I need to explore. 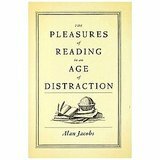 I haven’t started reading The Pleasures of Reading in an Age of Distraction in a systematic way, but I’ve been dipping into it. Funny thing: one of Jacob’s strong messages is to read at whim. At the moment, I’m taking a whimsical approach to the book. In, out, over, back, here, there. I collect books on how to write. Shelves of them. My favorites are the ones who urge me to read and read and read some more, with an occasional bit about writing. In Wordsmithy: Hot Tips for the Writing Life , Douglas Wilson piles on, with not only advice to read, but lists of recommended titles at the end of each chapter. One might not expect a manual on writing to keep you grinning like an idiot, but the humor in this book makes it impossible to read with a serious face. Short enough to read in one sitting, I’ve strung it out, savoring the flavors on each page. Wilson is the father to three remarkably accomplished children. Son, N.D. Wilson, is a best-selling author. Youngest daughter, Rachel Jancovic’s book, Loving the Little Years: Motherhood in the Trenches is always in my basket of goodies for new moms. I yelped in delight to discover, tucked on page 48, that Wilson’s firstborn, Rebekah Merkle has a forthcoming book, England Swings. Here’s a hilarious sample of Bekah’s writing. who come over frequently. I play the guitar, read, and so on. There are times when I just want to read a story, when I put my mind on cruise control—which, I feel compelled to point out, is not the same as turning it off—and pick up a novel. I am fully in the center of Trollope lovers; he’s one author whose complete works I would like to read. To be honest, I’m still languishing in the introduction. Once I get to Chapter 1, this book will likely triumph on top of the pile of books. Cindy at Ordo Amoris turned me on to Why We Get Fat: And What to Do About It . Even if you don’t agree with the premise of the book, it is a fascinating view at independent thinking. I’m smack in the middle and willing to give this way of eating a try. In addition to WWGF, I’m re-reading Alicia Stanton’s book, Hormone Harmony: How to Balance Insulin, Cortisol, Thyroid, Estrogen, Progesterone and Testosterone To Live Your Best Life . Whew! The title alone is daunting. I work part-time for a compounding pharmacy; we have 15 copies of this book that we lend to customers. I find it interesting that the message of this book dovetails quite nicely with Taubes’ book. I’m linking, for the first time, to the 5 Minutes for Books site. 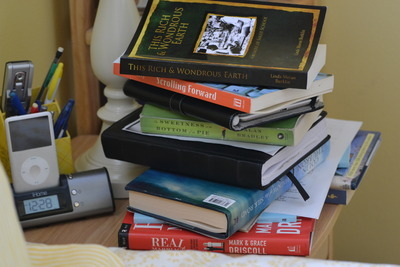 On the fourth Tuesday, you can share a What’s on Your Nightstand post. Join us! Do you set goals to read the complete oeuvre of an author? Do you get a little buzz inside your cheek when you read “she’s read all of [fill in author’s name]? And I tell myself little fictions about what I’m going to do. I’m thinking aloud, trying to articulate a reading plan for the year to come. The last plan I made, for 2010, was to read around the world. I read 18 of the 71 titles listed. And reviewing the list makes me want to renew that quest. 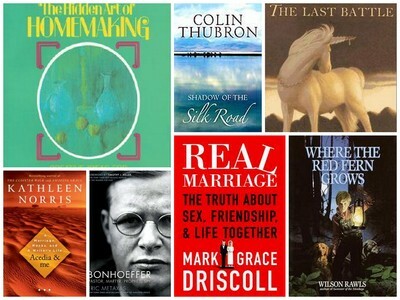 But when I listed the books read in 2011, I was disappointed in the absence of authors dear to my heart. So, without a formal reading challenge I’m planning to be more intentional with my reading. In my last post I asked why do you read? Thank you for your answers, which evoked many happy sighs. Thank you! My next question is how do you decide what to read next? In my case, it often depends on which bookshelf I browse. The entry-way shelf has an eclectic collection of books just received. Since they are new to me they are the equivalent of shiny objects. The hall shelf holds favorite authors, the Penguin collection, and books which look pretty on the shelf. The guest room shelf is an unorganized hodge-podge of books that no longer fit on the entry-way shelf. The living room bookshelf has the heavy hitters: history, biography, poetry. I love all the reading challenges that blow by me this time of the year: Ireland, L.M. Montgomery, WWI, North Africa. Part of me wants to join a half a dozen. But I hold back. I’d love to hear how you decide which book you’ll pick up to read. And one more question: who are the authors whose entire works you would like to read? Key phrase: would like to. If you had time to read, if you had access to every book, if, if, if…who would it be? When it comes to language, nothing is more satisfying than to write a good sentence. It is no fun to write lumpishly, dully, in prose the reader must plod through like wet sand. But it is a pleasure to achieve, if one can, a clear running prose that is simple yet full of surprises. My simple plan is this: Read one book from my list of high priority authors a month, before other reading. Then fill in with other books. Though I don’t write much about Bible reading, that tops my list. I’ve bounced between fast and slow Bible reading. I consider reading through the Bible in a year fast reading. But sometimes I catch myself zipping through just to put a checkmark in that box. Then I slow down. 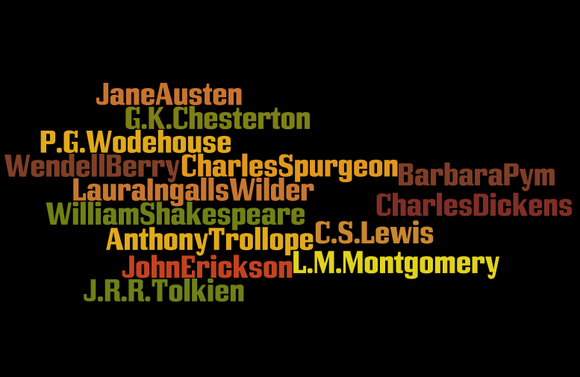 So if on December 31, 2012, when I review my reading, I hope I will see a Chesterton, a Spurgeon, a L.M. Montgomery, a Tuchman, a McCullough, a Dickens and a Trollope on the list. Yes, that would be lovely. Who is on your list: Jan Karon? P.D. James? Amy Carmichael? John Milton? J.K. Rowling? N.D. Wilson? Elisabeth Elliot? Agatha Christie? Anna Quindlen? Sigrid Undset? Hope said it; I confess it. I have more books on my Kindle than I could read in…forever. But I love knowing they are there. 2. I winnowed my Paperbackswap Wish List, erasing any titles I could get free on Kindle. 3. I’m reading my Bible on Kindle. Good for reading, not for studying. 4. My favorite is the underline feature. I can go to “My Clippings” for the underlined bits. 5. I don’t think I’ve spent more than $5 on Kindle books. 6. For the record, I still prefer reading print books. 7. But I like getting books I don’t have to store. 8. Why no Shakespeare? I ask myself. 9. Why no Trolllope? I can fix that. 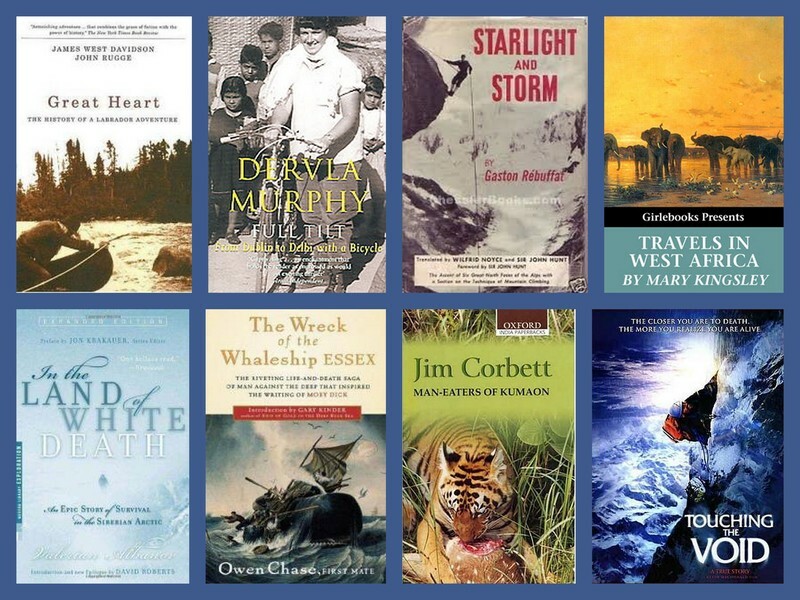 What are the essential ingredients in a great adventure story? The Latin root of the word, oddly enough, means “an arrival,” but adventure almost always entails a going out, and not just any going out but a bold one: Sail the Pacific on a balsa raft; pit your skills against K2; sledge to the South Pole. It is a quest whose outcome is unknown but whose risks are tangible, a challenge someone meets with courage, brains, and effort—and then survives, we hope, to tell the tale. Like a hot air balloon, book lists inflate and ignite me. I just stumbled across this May 2004 list. They are all thrilling, true stories. The website has a short recap of each book. Here is an abridged list of the titles (and links to Amazon) and Kindle availability. I’m interested in your feedback. Which books have you enjoyed? What areas would you like to vicariously explore? Which titles look intriguing? Are the books you would add to this list? 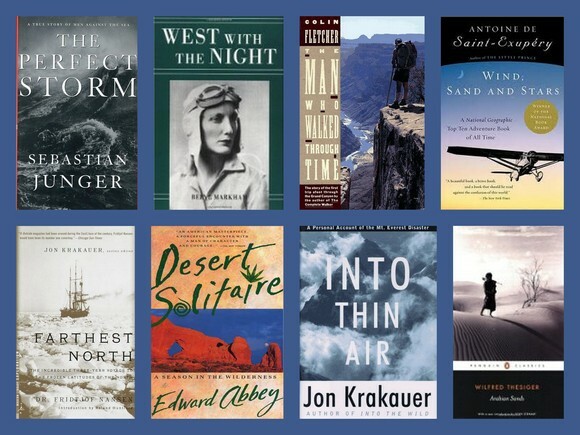 I found this list because of my interest in Beryl Markham’s West of the Night, which I’m listening to while I garden. (I love it.) Books on my shelf: 16, 17, 27, 33, 37, 53. 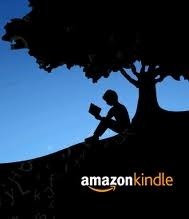 Books on my Kindle: every Free title. It’s a knee-slapper that someone who rarely takes mild risks loves adventure books.